We met Damian Day in Rotorua. He’s a blog reader who has been following our site for about a year. Through Facebook we were able to meet up in town. His story is inspiring and humbling. 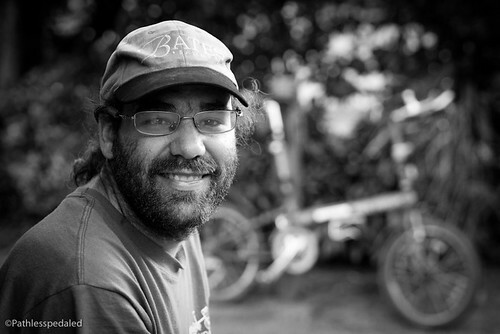 Despite having several nerve disorders in addition to being autistic, he rides his bicycle 8-10,000 kilometers a year. He has to. His bicycle is his physical therapy and if he doesn’t keep riding he may end up in a wheelchair. We spent a few days chatting and getting to know him better at a backpackers. We split ways on Christmas eve and wished each other well. We always keep a look out now for another cyclist on the road with small wheels pulling a trailer. Keep the rubber side down, Damian! Great piece guys. Real inspiration. This is such a wonderful video. Damian is an inspiration. Meeting people like him is (for me) the best part about touring. Keep up the great work! Loved the video…and THANK YOU for subtitling it! I have a hard time understanding people with thick accents or speech impediments. Wonderful, inspiring interview! Technical: Russ, which lens? Strong portrait! It is so amazing to learn about regular people (not famous/infamous) who blow everyone else out of the water so nonchalantly as Damian appears to be doing. I want to know more about him. Thanks for your amazing documentary shorts. I am SO glad you interviewed Damian Day, what an awesome person. Like many have said he is an inspiration. I especially liked his take on those who complain and found myself rethinking my day. Thank you for another great video, Russ, and another insight into the power of cycling! The road is my home, my home is my home away from home. Written last summer lost somewhere west of Bend. great video! thank you for sharing Damian’s story; it’s quite moving. keep on pedaling Damian, Russ & Laura! This was an absolute inspiration and a heart-warming story – thank you so much for sharing! I was reading about your awful experience in Wellington and came through to the site to find out more. What a treasure trove of stories and wonderful people and adventures. I’ll keep following your blog and I’ll be keeping an eye out for Damian Day on the roads – what a champion! Have been following your NZ blog and now read in the paper of your Wellington attack. Very ashamed of NZ and ashamed to be a Kiwi. NZ drivers are appalling. Safe travels for the rest of your stay. In response to Jolene (comment #1), who is looking for a bike to carry 185+ lbs: give Bike Friday a call! I’m your size, and I ride a fully-loaded Bike Friday, and tow a heavy trailer with it. Great custom fit, and rides well too. Nice interview. Saw Damian riding his Bike Friday west from Waitomo as we were driving east to Waitomo on 20 Jan. Had a big smile! Would have liked to have stopped and talked BFs (I own singles and tandem), but we had reservations to keep. Love your work Russ and Laura. Im a kiwi, currently living in the Swiss Alps. Its been snowing here in Interlaken a fair bit the last few days but its still easy to do my short commute by bicycle. Your cycle touring stories are inspirational. Im interested in some adventure touring through Africa!! I love all your interviews and photos! This one is one the most beautiful. Thanks so much for sharing this. People need simple things to see to inspire and this certainly delivers it. I shared it on my Facebook.